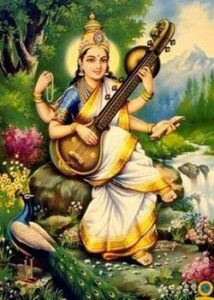 Sarasvati Devi is the Goddess of speech, learning, and fine arts, also believed to be the creator of the language Sanskirt and its script. She is the manifestation of purity. She is found sitting on a Hansa (swan) or Padma (Lotus). She has four arms two of which plays the Veena, one holds the Vedas and the other holds a Mala (rosary). Sarasvati Devi is the chosen deity of many students. Students who desire to sing and desire the gift of eloquent speech prayer to her.